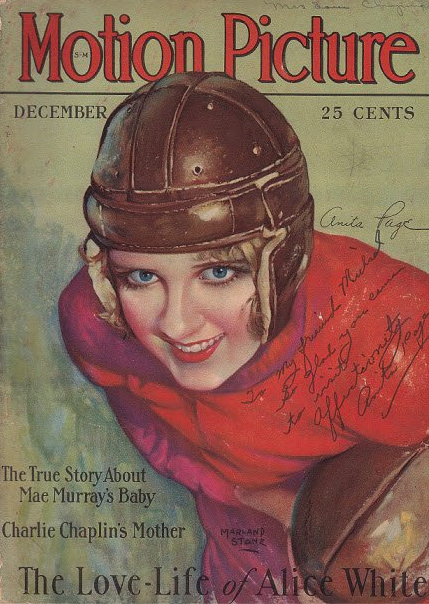 Of the ones I interviewed from the silent film era, Anita Page stands out as the best. I think it’s the best interview I did. If not, it’s the one I enjoyed most. She was charming, immediately open, down to earth, and friendly. As long as you didn’t mention Joan Crawford, but that’s another story. When I think of Anita today, several treasured times come to mind. I remember the first time we met. It was somewhere in the mid-1990s. I went to her apartment with actor Randy Malone the day I flew to Los Angeles. It was about 10 p.m. and Anita was out on the town with her daughter. She arrived home around midnight and we sat up ’til about 2 p.m. chatting away. She sat underneath a photo of herself in her Barbara La Marr pose. The next evening, we had our real interview. I asked the questions. Anita chatted and elaborated. She looked at stills and old newspaper clippings. I asked more questions, and Anita chatted and elaborated. Between sipping champagne and nibbling on cheese puffs, the time flew. We sat up ’til almost 3 a.m. Anita Page was a night owl. 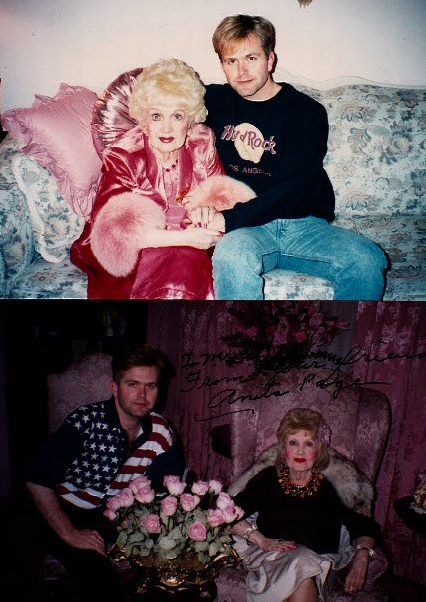 The bottom photo is the night we sat up into the wee hours of the morning talking about Anita’s Hollywood. The top photo is from another visit. I saw her at least twice on subsequent trips to Hollywood for interviews and various research projects. She was always the same. Friendly, lovable, and chatty. Quite content in her own world. I even took Charlie to see her. By the time we left, again, another late night, Anita had gotten comfortable on the sofa in front of the TV. She waved to us. “I hope everything turns out okay for you boys.” That’s the last time I saw her. She lived to the ripe, young age of 98. She passed away on September 6, 2008. Anita Pomares, who became known on the screen as Anita Page, was born on this day in 1910. I lift a flute of champagne and say, “Happy Birthday, Anita!” I might even nibble on a cheese puff or two. Our interview was featured in my second book, The Sound of Silence. I have two notebooks full of stories she told me. Someday, I might publish them in their entirety. I might do a full-length biography of this amazing woman. I just don’t know — yet! When Anita was autographing this magazine cover for me, Randy asked her to sign it, “Affectionally.” “Oh, I couldn’t do that! Randy reminded her that I had flown all the way across the country to see her. “Well, okay,” she said.